Win a Targaryen Handbag from the Official Game of Thrones Line! The Game of Thrones merch train just keeps on chugging along, with cool new stuff coming out regularly even as we plunge headlong into the winter of our offseason. As we reported in October, HBO and Danielle Nicole have teamed up for an opulent new line of Game of Thrones accessories. The line features Houses Stark, Lannister, and Targaryen in an 18-piece collection that includes backpacks, crossbody bags, pouches, wristlets and coin purses, with pricing ranging from $18-$88. The pieces are made with non-leather materials and will be available at Boxlunch.com, and available on December 8th at Danielle-Nicole.com. But lucky for our readers, we’ve got one of the handbags already. The Targaryen Crossbody Bag, pictured above, will be won by one of you! For the next seven days, we’re accepting entries in this worldwide giveaway. Method #2: WotW Twitter: Follow our Twitter, WatchersOTWall, and retweet the Targaryen Bag Giveaway tweet (you must do both for the extra entry). If you already follow us, no problem. Simply retweet the contest post. Method #3: WotW Facebook: Like the WatchersontheWall Facebook page, and Like and Share the Targaryen Bag Giveaway post (you must do both for the extra entry). If you already Like our page, again, no problem. Just share the contest post and you are entered! Entries are accepted for seven days, closing the giveaway for entries on Friday November 16, 2018 at 5PM ET. The winner will be randomly selected from the entries, and announced shortly thereafter. Twitter and Facebook are their own entities and are in no way associated with this giveaway. This is the perfect accessory to my mostly black wardrobe. I’m hoping I win! Generic comment from the show! That crossbody purse is perfect. Heck, even our Khaleesi would want one! It will be a perfect present. Thank you! I really need another bag! Beautiful bag! I hope I get it! OH wow – perfect gift for the wife’s birthday! With the last season approaching, this is the perfect keepsake for a diehard fan like me. Thanks for the opportunity! I’m shocked there are only 15 responses here! Are all the Targaryen loyalists asleep? I need it in my lifeee!!! Nice designs but “The pieces are made with non-leather materials”, i.e. some kind of advanced plastic is a bit of a put off. If I win, I’ll give this to the most Dany fan regularly commenting on here. Which would be… I’m not sure. Great though that WOTW is reckoned important enough to be given these GOT merchandise freebies. Yay! We mean something! Everyone needs a dragon… or a bag with the dragon. I need this, for reasons! my girlfriend would love this! Eek! This would make a great early birthday gift!! Oh man I love so many of the pieces. Crossing all my fingers and toes! I would love to win this amazing purse! omg that is freaking awesome!!!!!! A girl would love it!!!!! I really need a new handbag. This one is just perfect. Please consider me! That round Targaryen model is cool! Gotta love the red leather !!! This would be a big pick me up! Good luck to all but hope it’s me! Has anyone found this bag on boxlunch.com? I keep checking but can only find the coin purses for the three sigils and the Stark grey backpack. I really want to buy this bag!! I forgot to look for it until November 9 so I’m wondering if it sold out in a day or if all the pieces aren’t available on that site. Hope for better luck next month when it becomes available on the designer’s website. Better yet, I hope I win. This bag is the best of the collection!! I like the Lannister sigil clutch too. Oh, way cool! Please let it smell like Dragon Fire. Hooray for faux leather! 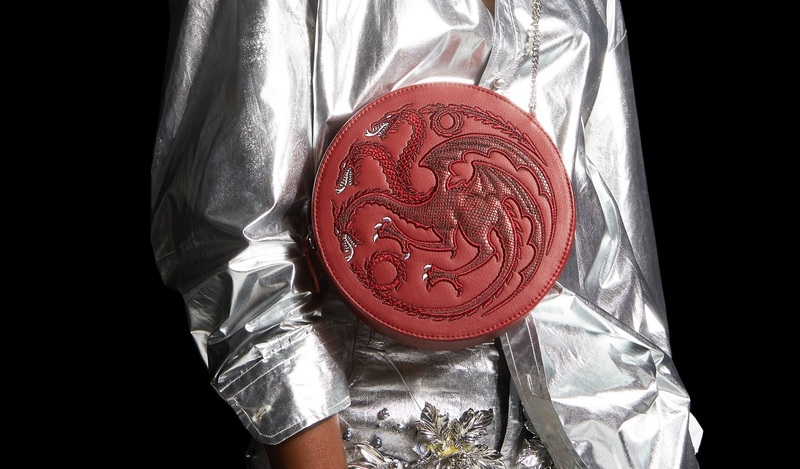 I’ll take this bag, with fire and blood. My wife would love on of those. Would make an excellent Christmas gift. Fire and blood baby!!!!!!!!! LOVE it! 🙂 If I win it, I’ll use it all the time! Beautiful! Would love to own this! This is the bag I wanted when I saw they were releasing these! Be so cool to win it!! Good luck. Winter is Coming! Wow! This one is the best! The bags are rather fab! But the last time I Iooked (today, Saturday, at 8:56 am EDT), you hadn’t entered this giveaway contest. In the unlikely event I win, may I play Santa and present this red purse to you? Unless you already got one for yourself as as early X-Mas gift…. Would love this so much!!! This is an amazing bag! F**k the Iron Throne, gimme the bag! So excited for all this new merchandise! I don’t want this purse. I NEED this purse. I collect purses and I already have a Star Wars purse and hoped that GOT would eventually put out purses as well. Let me have it pretty please! This is an awesome handbag! What a fabulous early Christmas present this would be! I could definitely live with this. I love this purse!! Its super cute! Looks like a beautiful purse! Hope I win! House Targaryen for the win! Great bag! I think House Targaryen really redeemed itself with Dany and Jon. These bags are so beautiful!! Fitting for a Queen! This is amazing! I took a look at the designer’s website, and let’s just say I never needed to know it existed…all of the handbags look amazing! O pretty, pretty please choose me~~My dragon blood is yearning! The bag is very beautiful. Has the giveaway ended?